Espressif ESP8266 is a very popular platform for IoT applications relying on WiFi, at least for hobbyist, while Espressif ESP32 is the new solution from the company that adds a CPU core, faster WiFi, Bluetooth 4.2, and various I/Os which should launch very. 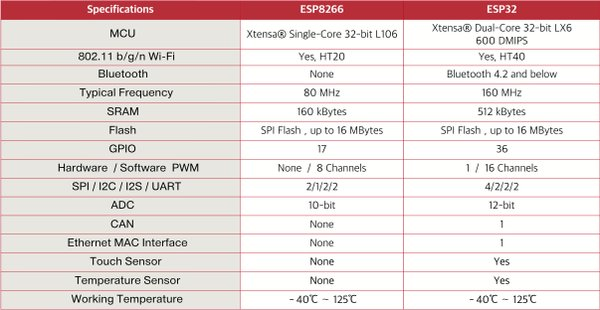 Amica.io released a table showing the main differences between the two processors which are expected to coexist in the market with ESP8266 used in the lower cost segment, and ESP32 in applications requiring WiFi and Bluetooth, or some of the new interfaces. Some of the features were clearly listed when ESP32 was first announced, but for example I was not aware that an Ethernet MAC, and a temperature sensor were built into the new SoC. This makes ESP32 look really exciting. ESP8266 wasn’t bad but this new one seems even better and it seems to have almost anything you could ask for. And there are still things hidden in the ESP32 that haven’t been found yet. It is like an Easter Egg hunt! Is there any data on energy consumption, both in idle when no data is being sent/received, when transmitting, and during periods of max consumption ? Other than warnings that the ESP8266 demanded a high -power supply due to its high peak current consumption, I have seen little data published on ESP8266 energy consumption, or power management. Is 512k correct? I thought it was closer to 400k and approx 200k free for user app. esp8266 is 80MHz – 160MHz, esp32 is 160MHz – 240MHz. When the 8266 is clocked at 160MHz, wifi reliability goes down. Since the 32 is duel core, I suspect it doesn’t have the same drawback at higher clock speeds. Any update on how many https sessions will be supported, 8266 is only 1. I don’t think they have set the price exactly yet. But that have said “only a little more”. Esp8266 can support multiple SSL if you customize the firmware but ram is limited. With close to 4x as much ram and hardware crypto engine esp32 should support many more. Of course still depends on the right SDK configurations. if ESP8266 really has a second uart, so no need to switch uart from programming and run mode anymore! Temperature sensor will not be very accurate, since is influenced by the CPU activity. EspressIf also recommend to read temperature before starting the wifi, which also influence the value. Acctually isn’t too fast.. You can find ST and Renesas MCU up to 240 MHz..
Hi, dose the ESP 32 support OTA? Both ESP8266 and ESP32 support OTA firmware update.